Port Macquarie’s newest tourist and local attraction. Introducing the MV Port AdVenture. 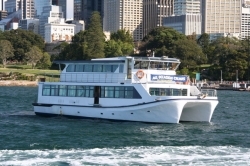 This beautiful white luxury catamaran is the biggest and best vessel ever to set sail on the Hastings river. Private parties including Christmas, Corporate, in fact – Weddings, parties, anything! Entertainment cruises, specialising in Tribute shows with Mamamia ABBA, Beatles, Elvis and Lazy Sunday afternoon live Jazz. This is Entertainment with a view! The MV Port Adventure is fully licensed and all cruises include sensational and mouth-watering options. You are welcome to inspect the vessel. We can tailor make your cruise either as a private function up to 190 guests or you may consider one of our shared options with catering and entertainment of your choice.